Maureen: Where do we start? Kirstin: It was an interesting experiment. Maureen: Interesting is one way of putting it. Kirstin: There’s definitely a technique for doing food tube cooking. But I don’t think they’re designed for you to cook from, really. Kirstin: …which is weird. I don’t watch food programmes for entertainment. Maureen: Do you watch them at all? Maureen: I’ll watch them, but only if they’re people I really like, Nigella and Jamie, and also if I happen to be home and available when they’re on TV. But as far as going on You Tube to find a recipe to cook tonight? Forget about it. Kirstin: There were some good recipes. I liked the chicken stir fry and the fish was good too. But the problem is I would often get lost watching bloopers videos instead. Maureen: You can’t make a dinner form a bloopers video. I think the bugbear of this whole exercise is the lack of a printed recipe I can find easily. Kirstin: I don’t need a printed recipe, just a list of ingredients easy to find. It’s not rocket science. Maureen: At least if the ingredients were listed below the video, you’d could figure out what you needed to make it and what you had to shop for, then you could watch the video just before or while you’re making it. You wouldn’t have to watch the video with a pen and a piece of paper, which got annoying after a while. Kirstin: Exactly. I’m flummoxed as to why they haven’t done it. Maureen: If this is the future, I don’t like it. Kirstin: There’s other things they could do to make it better. They could group the recipes together by theme, like Asian recipes or Italian or chicken or whatever. Maureen: If it was Fish Friday and I wanted to make some fish, it would have been nice if they were all in one place so I could find them easily. Instead, they were all over the place and difficult to find. Maureen: I love Gennaro. Everything he makes is delicious..
Kirstin: Maybe the future of cooking is still in a cookbook. Ii’ve tried recipes on kindle and the iPad and that doesn’t work. On the iPad, the screen goes sleep and you’ve got mucky hands and you don’t want to touch it, so it just becomes difficult. It’s just so much easier with a book. The only books I buy now are cookbooks. 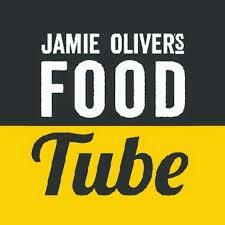 Maureen: It was an interesting exercise, but Food Tube seems like a propaganda tool for Jamie Inc. Overall Grade (A- F): (Maureen) F. I don’t think it really works as a culinary exercise. (Kirstin) D: It was interesting. I’m glad we did it. 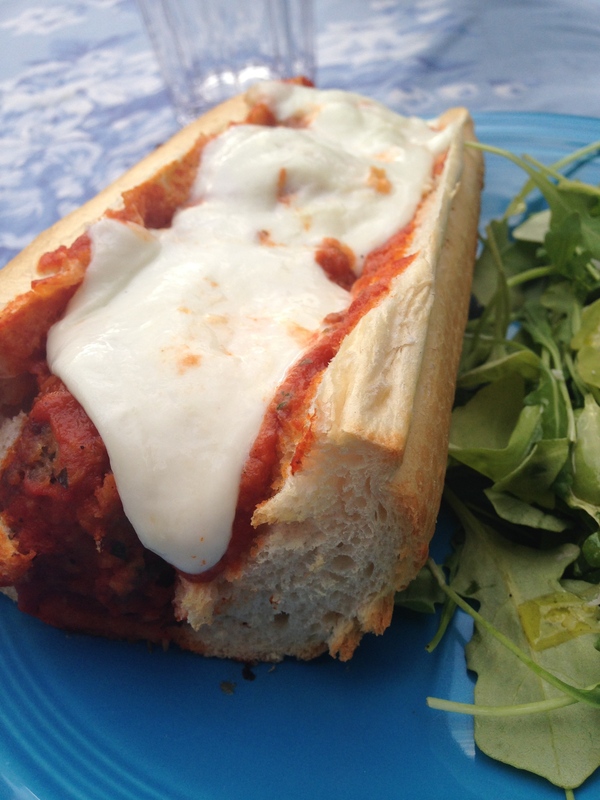 Best recipes: Maureen: Meatball Sub! Kirstin: Salmon. Grade for Photography (A-F): Not applicable, since we just watched videos all month. Video is the future, apparently. Bookshelf or Charity Shop Donation? Again, not applicable. When I made this dinner, I knew this would be a sure thing. There isn’t often in life where you can be certain that “A Sure Thing” will materialise– see the 1985* movie with John Cusack if you don’t know what I’m talking about– but this is one of those times. I’ve got the method down pat now. Gennaro Contaldo, the star of this video, does a good job of showing people how to best make risotto, if they’ve never done it before. 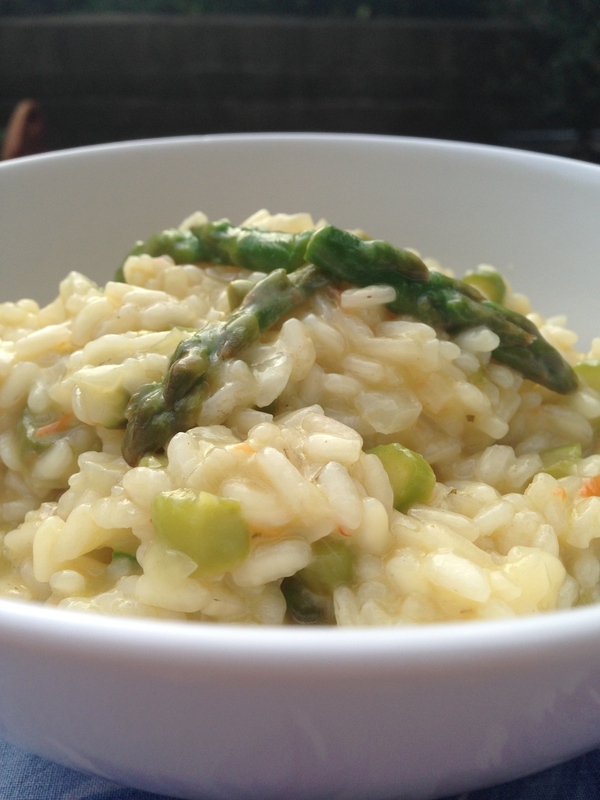 Two of the unique things he did in his version of asparagus risotto were first to cut the asparagus into slivers, and then to take the tips and cut them in half vertically. Excellent tips, both. This was a sure thing. Everyone loved it. At the end of the video, Gennaro takes a bite and says, “Yes! Yes! Yes!” I feel exactly the same way whenever I have risotto. Love it. Maureen (while admiring the sandwiches and plating them up): This is going to be SO GOOD. Nicholas (12): Can you provide a written guarantee for that? Maureen: Ha. You’re funny. Go sit down. Andrew (15, taking a bite): This. Is. GLORIOUS. Maureen: See? What did I tell you? I couldn’t agree more. Nicholas: This is good, but messy to eat. Maureen: Well, sure, but that’s part of the fun. When I was growing up, meatball subs used to be one of my favourite things to eat. Of course, growing up in Northern New Jersey, they knew how to do both a meatball and a sub, so it made for some good eating. Tim: I think the meatballs get a little lost, with the cheese and the tomato sauce. Maureen: I can see why you’d say that, but I disagree. I think the extra sauce and the extra cheese is all part of the experience. I see that you’ve followed Gennaro’s instructions to put the rocket salad in the sandwich. I didn’t do that as I thought that was sacrilege. Andrew: Remember that great meatball restaurant we went to in New York City last summer? Maureen: That place was great. What was it called? Nicholas: It was called The Meatball Shop. Maureen: Good memory! It does what it says on the tin. I would definitely go back there again, and I would definitely make this again. Do you guys agree? Tim: Sure, but maybe with less sauce. Note: If I’ve said it once, I’ve said it a thousand times this month: it does my head in that they can’t list the recipe, or at least list the ingredients, in the text underneath the video on FoodTube. Oddly, there is a recipe for this on Jamie Oliver’s website, but it’s not the recipe that’s in this video– perhaps there’s more than one version of the meatball sub– so I won’t link to it here. Andrew (15): Is this a Jamie Oliver recipe? Tim: What’s with the feta cheese? 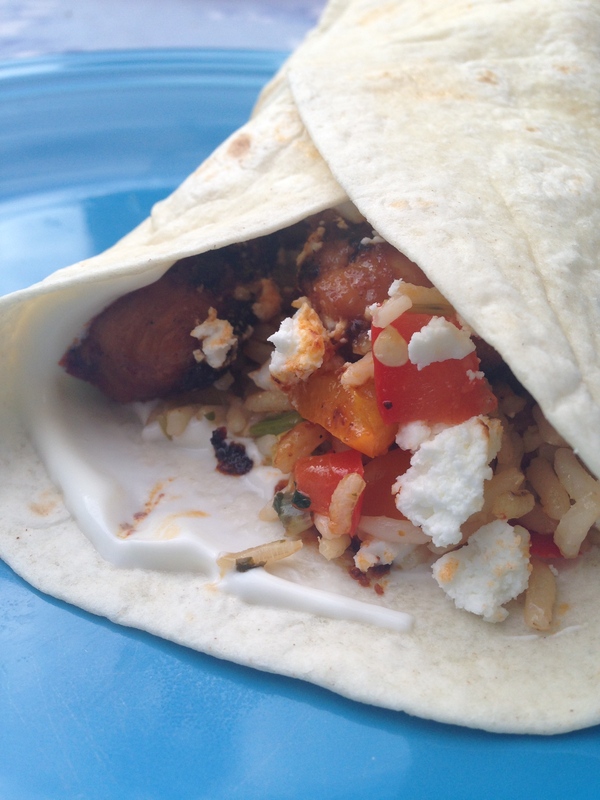 Maureen: Jamie said to use feta cheese on the burritos. What Jamie wants, Jamie gets. I know it’s a bit strange, but I started thinking about it, and feta isn’t unlike the crumbled cheese they use at Wahaca, so I went with it. Nicholas (12): I think it’s good. Maureen: It’s appropriate that you would use Spanish to describe how much you like this dish, since we are having burritos. Tim: The spciy rice is good. Maureen: It’s a variation of the cowboy rice we like so much, though in this case, you use pre-made rice. This is because the recipe was sponsored by Uncle Ben’s, which strikes me as a bit strange, but there we are. Despite use the pre-made rice, it’s made significantly better with the addition of fried peppers and onions. Yum. Nicholas: We should definitely have this again. Maureen: The only change I made is I didn’t make it with leftover turkey tossed in barbeque sauce, since we didn’t have any turkey. So I fried up some chicken with fajita seasoning, like I usually do, and that worked a treat. Tim: Huzzah for burrito night. Ella: I like the chicken. But I don’t like the carrots or broccoli. Kirstin: But you have to eat them anyway please. Miles: Yes, everything is edible. Ella: Everything is edible. Once. Kirstin: The chicken is lovely and succulent. I would certainly consider making this again. But I would definitely have liked the recipe posted somewhere. It’s a right old faff getting the ingredients sorted from the video. She had some neat tricks about steaming along the way which I loved too. Kirstin: This is apparently the real spaghetti carbonara by Antonio Carluccio. Kirstin: It’s good and simple. Perfect for a summer day. 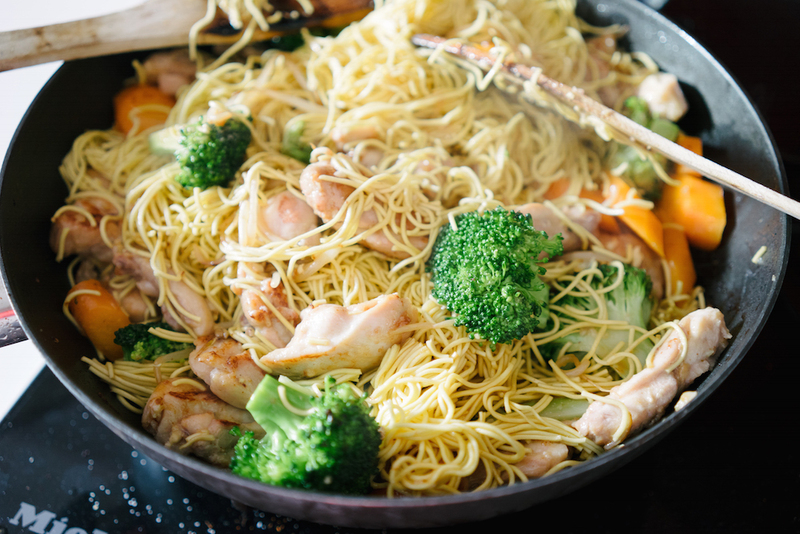 No cream, just yummy Italian ingredients. 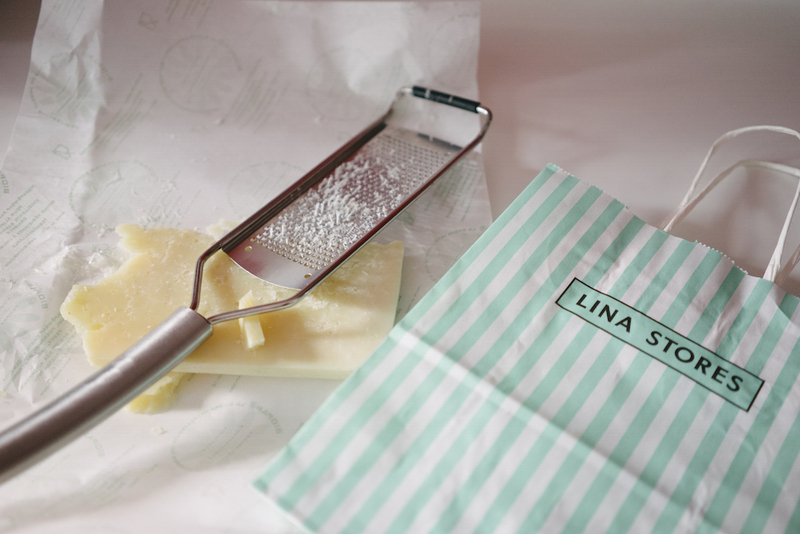 I went to Lina Stores to get the pecorino in Soho. Tom: Miles, you might find it easier to twizzle your fork with the pasta against a spoon. Like this. Miles: Spoons are for the weak, I tell you! For the weak! Kirstin: Miles was off sick today so we thought we would make some chocolate chip cookies. What did you think of them, Miles? 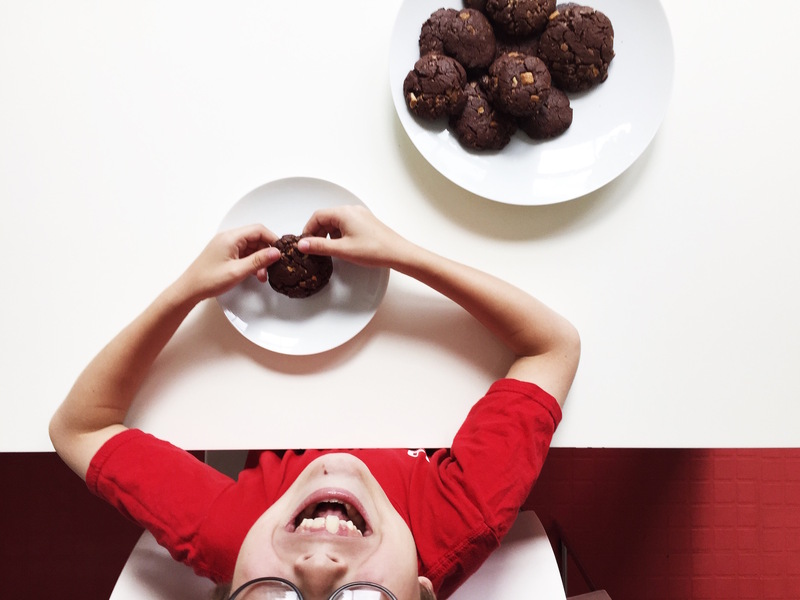 Miles: I liked smashing up the maltesers because I’ve never used a hammer when cooking before! And the hammer had spikes on it too. Kirstin: Excellent. Did you like the cookies? Miles: Yes. I would definitely like to have these again. Kirstin: I liked the malted chocolate aspect to these. And of course the video was loud and full of mad music. Also, I have no idea who Alfie Deyes is, so clearly I am getting old. Here’s the video if you want to have a go.